Yup, from making espresso to homemade pasta sauces, cheddar biscuits, cookies, drinks and more… we don’t let the tiny size of our mobile kitchen, or not being in our own kitchen even, stop us from cooking up something yummy with our friends and family coast to coast. Step inside this travel cooking tip sharing interview with author, traveler and chef, Jacqui Treagus, and yours truly- as we chat about travel cooking. 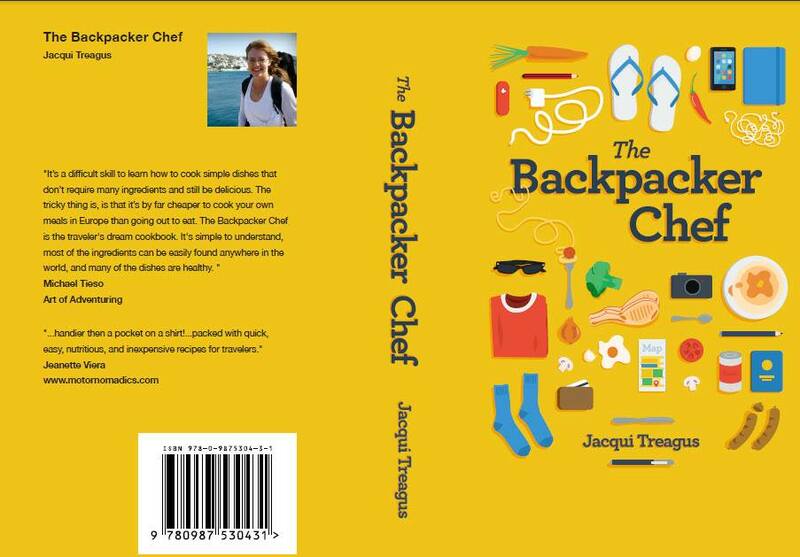 I’m quoted on the back cover of the print edition “The Backpacker Chef’ cookbook! It will give new cooks more confidence and it will make those of you with some skill over the heat, a better prepared traveling chef. This travel sized gem is a must have for backpackers, boondockers, campers and motorhome travelers alike. It’s my pleasure to lend a hand (and a quote) to Jacqui in spreading the word about this great travel cooking cookbook by being an affiliate. Share good food – Click here to visit Roaming Cooking and buy the cookbook for your travels! Hi John, yes I know, that’s my fault. I realised after I had them printed that I had transcribed the word wrong to the cover designer – my apologies Jeanette. Damn!